The above quotation from the Bible was of course spoken by Jesus Christ. But as we see daily, there are many Messianic personalities in the “Christian” Alternative Media world who feel that when their lordships are in jeopardy, the rules of plausible deniability apply to them, as they deny that they ever knew those who assisted them in their moneymaking enterprises. The Lordship which will be examined here today is none other than that of Steve Quayle, who while he is in his early 60’s, is still able to gad about the northern and southern Americas in search of giants. To our everlasting admiration, he is able to get his adventures paid for by the generous gifts of others. Now this brave adventurer in search of giants is so afraid of a senior citizen who lives 1700 miles from his home, who is without funds and without a car, that Quayle has felt the need to lawyer up. This big brave man has employed a lawyer to protect him from this lady’s assertion that he, the famous Watchman of God, Steve Quayle, markets his products through fear based marketing strategies. In the most recent lawyer-escapade of Quayle he politely denies that the little phantomlike creature that he had created called V The Guerrilla Economist had any influence whatsoever on the marketing of his precious metals during the infamous 2012 Campaign of Impending Doom. Now we know that his lawyer must have been employed in the latest round because of the polite professional tone of his words. Some people would defend Steve Quayle’s crankiness towards this lady as being the result of having to deal with too many people who have tried to touch his anointing, and I am not referring here to his Washington Monument replica which stands at the entrance to Camp Quayle. 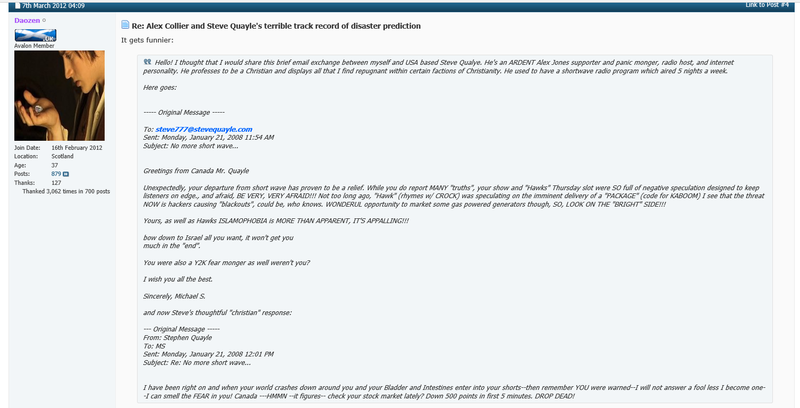 Let us go back in our time machine, to say 2008, and read one cranky example of how Steve Quayle usually talks with his critics. I wonder what Michael S’s opinion would be of the 2012 buildup of fear which was promoted so heavily by Hagmann and Hagmann, Steve Quayle, Tom Horn, Dave Hodges and others of the internet “Christian” Alternative Media network? Back in 2012, Steve Quayle started building up another hard driving scenario of fear, and he introduced to his listeners a financial economist called V. In the beginning his build-up involved various QAlerts, starting on March 12, 2012. This is documented here at Steve Quayle.com which includes an 89 page PDF of V’s emails. If one types in a search engine the words Steve Quayle and V the Guerrilla Economist, we find quite an interesting history of fear mongering tactics. Here is but a short sample. On May 7, 2012 one of Steve Quayle’s red alerts was posted for discussion on the forum at Lunatic Outpost.com. Here is a screenshot of the red alert found on this site. 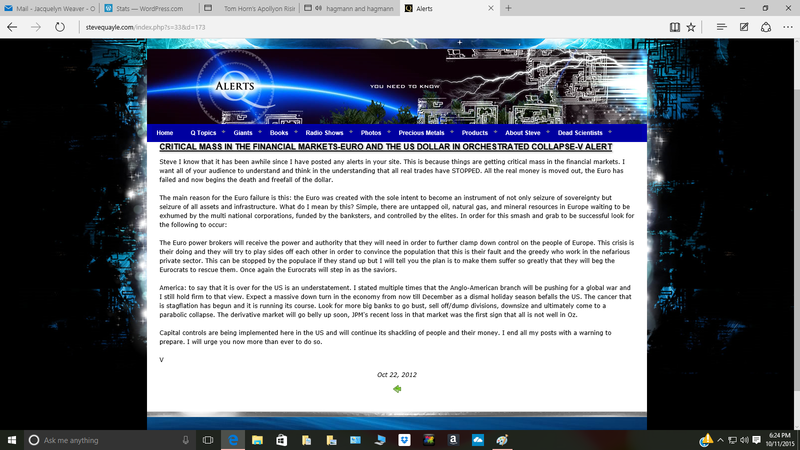 On August 13, 2012 Planet Infowars.com in a post called APPOLYON Alert from Steve Quayle, reprinted an alert called “Endgame Activated-Warning from V”. In this 2013 post, Doug Hagmann at his Northeast Intelligence Network website justified the anonymity of V, and backed up his “credentials”.. Here is a screenshot. 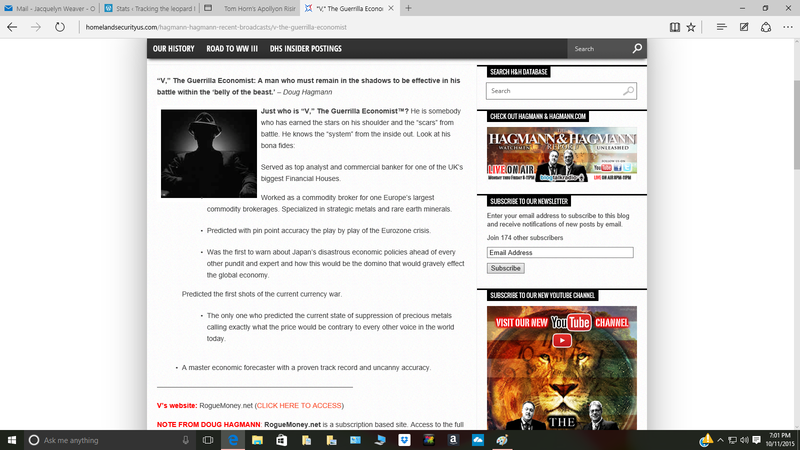 On May 24, 2013, Revolution Radio.org and Paul Martin commented, “The culling of the economic unwashed is about to begin” and they reprinted an article written by the Hagmann and Hagmann Report heralding the financial advice of V, The Guerrilla Economist. On February 5, 2014 Alex Jones featured a video called “V’s Alert- More Assassinations of Wall Street Banker’s Going Down-Hit Teams Fully Operational on Wall Street. On July 17, 2014 My Daily Informer.com printed a warning from Steve Quayle stating, “Major American Cities Will Disappear! Steve Quayle and ‘V the Guerrilla Economist’ Alert! I think you get the general overall picture from the above sampling of headlines. Now most people have wondered why Steve Quayle and Hagmann have turned against the Golem they created named V. For a number of months have gone by and V the Guerrilla Economist (not to mention that other golem W), has ceased to make appearances on the Hagmann and Hagmann radio show. 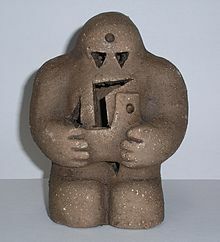 In case you are uninformed, a Golem is an animated anthropomorphic being magically created entirely from inanimate matter. Now as I understand it, if a golem turns against the creator, all one has to do is read the words which created the golem in reverse. Thus V the Guerrilla Economist in reverse would be TsimonocE AllirreuG eht V. Try saying that!!! And now you know why Doug Hagmann has taken to stuttering so much and Steve Quayle has been in denial about his relationship with V.
And just where is V these days? Well recently he “appeared” on the Greg Hunter show looking very much like a long lost Golem. He made such a great impression that it would behoove you to read the comments of some of the listeners who don’t think too highly of his credentials nor of his advice. 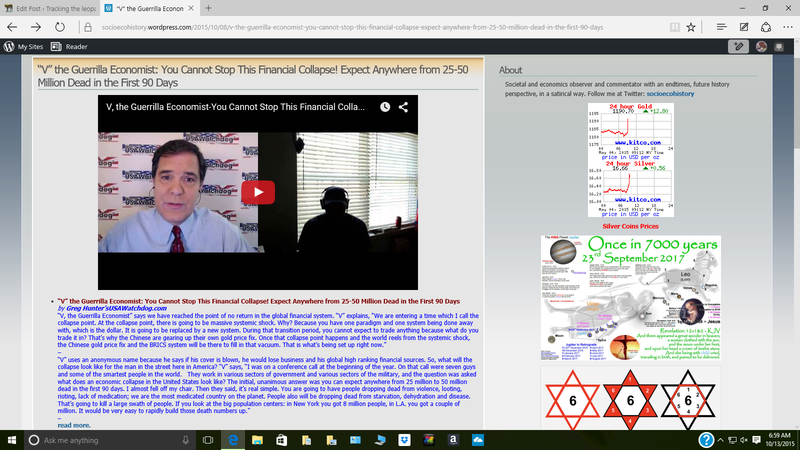 This latest appearance can be found here with the hot headline, “V” the Guerrilla Economist: You Can’t Stop This Financial Collapse! Expect Anywhere from 25-50 Million Dead in the First 90 Days. This entry was posted in Christian Alternative News Media and tagged 2012 Fear Campaign of Quayle and V, doug hagmann, Hagmann and Hagmann Report, Infowars, steve quayle, V the Guerrilla Economist by Jacquelyn Weaver. Bookmark the permalink.